Blog Developer Post Hackathon Advice: What Should You Do Now? You’ve worked tirelessly through the night, built something awesome, and presented it to a panel of judges. It could also be that you gave it your best try but came up a little short of having something worth presenting. Either way, you left the hackathon with maybe a prize or two, some new knowledge, a few new friends, and a bag full of swag. But what’s next? What do you do after you’ve had a chance to shower and rest post hackathon? You could choose to continue working on your project, finish it if necessary, or add that cool feature you didn’t have to the time to implement. On the other hand, you could forget about it, remembering it for the fun and learning it provided. After the Developer Week Hackathon, Kevin Burns and his teammate, Brett Henderson decided to forge ahead with their project despite setbacks that prevented them from presenting the final product. Their dedication to their idea ended up being rewarding. I had a chance to catch up with Kevin last week about their progress since the hackathon in February. Before Developer Week, Kevin and Brett had never met. Like many hackathon participants, they came to it without a team or idea. Kevin tweeted the need for a partner and thanks to a retweet from the Developer Week Twitter account, he and Brett connected. Their strategy was simple: check out the various sponsoring companies and try to combine technologies in order to create an application that would give them multiple chances to win one of the many prizes offered. They ended up combining SparkPost’s inbound relay and transactional sending services with IBM Watson’s sentiment analysis services to create EmailAI. How does an email feel? Communication via text is difficult. Sometimes when we write a message, it is read with an unintended tone. Enter EmailAI. A user can email a rough draft of a message or essay to this service and receive a response reporting the analyzed tone and emotion of the text. This report can be used to improve the message before it goes out to its intended audience. Unfortunately, the team met some challenges as the night went on. Issues with their domain name provider prevented them from quickly setting up the bones of the application. It also hindered them from receiving and replying to an email. Thankfully, with the help of the SparkPost mentors, they moved past it and start receiving messages and issuing replies. Alas, so much of their precious time had passed. Their next challenge was to transform the sentiment analysis from IBM Watson into a readable format. This involved locating and manipulating the relevant data for the response email. At the end of the 24 hour hackathon, their project was just shy of operational. They presented what they had and received some great feedback. Because they felt that they were so close to finishing it, they decided to continue collaborating and eventually got the service operational. The guys had a little extra motivation to get the application running because they decided to submit it for a Sparky Award. What they were able to accomplish using the SparkPost API impressed the judges. They ended up receiving the Grand Prize. Have an interesting post hackathon story? Share it in the #hackathons channel on our Community Slack or comment below. 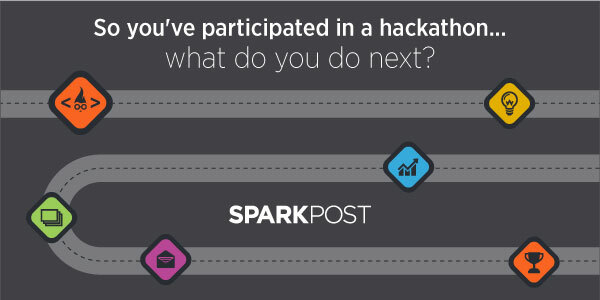 Check out our Hackathon section of the Developer Hub to see which hackathons the SparkPost Dev team will be attending.